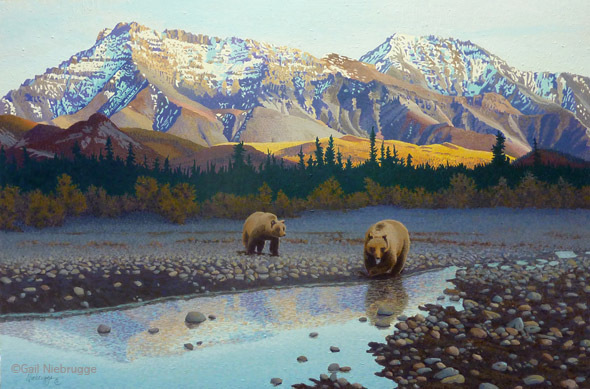 Original painting “Teklanika Bears” 23.5″x35.5″ acrylic on Masonite by Alaska artist Gail Niebrugge, call for price and availability. Two young Brown Bears ambling along the Teklanika Riverbed near the Teklanika Campground in Denali National Park, Alaska. While staying at this campground one fall, these two curious bears made a daily visit strolling through the camp sites looking for food. Fortunately the campground hosts kept a very clean site and soon the bears moved on. I love this time of evening when alpen glow bathes the distant mountains, leaving the foreground in the shadows. This mini art print by Alaska artist Gail Niebrugge is printed with fade resistant ink on acid free paper. “Teklanika Bears” is also available as a larger print and a note card. I bought this as a mini print, my 3rd one from Gail… Gail’s art brings Alaska into my home and keeps my happy memories from there alive. I also love that she is a nature artist and brings the vastness and beauty of Alaska into her art. I just love the prints I have been able to collect and hope to continue to add to my little collection soon!! Thank you Kathy! Glad the order arrived o.k.